Foldable design, more portable and easier to collect. 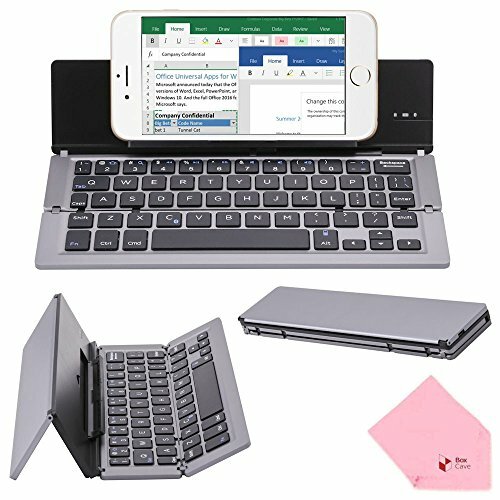 [SUPPORTS the 3 MAJOR OPERATING SYSTEMS] and works for most tablets and smart phones: F18 Bluetooth keyboard support 3 major systems(IOS/Android/Windows), and workable for most tablets and smart phones like: iPad Pro 9.7 / Air 2, iPhone 6/7/8 plus, Samsung, LG, Nexus, Huawei, ZTE, etc. [PORTABLE DESIGN] closed Size: 2.2 x 8.9 x 0.63 in. Easy to carry in your pocket / backpack / suitcase bag. Travel freely anywhere without the hassle. If you have any questions about this product by BoxCave, contact us by completing and submitting the form below. If you are looking for a specif part number, please include it with your message.